Q: Over the Rainbow - is this some kind of reunion or a new "version" of the band Rainbow? 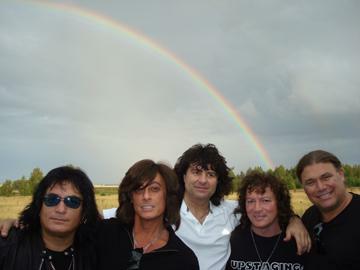 Joe Lynn Turner: It's a celebration of the music of Rainbow from all of Rainbow's "eras" and features four former members of Rainbow [for more info see our Over The Rainbow info page or the Over The Rainbow Official MySpace] along with the son of the founder of Rainbow, Jurgen Blackmore, on guitar. It's Over The Rainbow, not Rainbow. 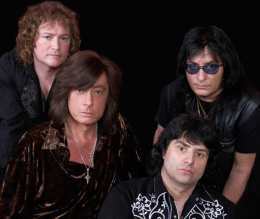 In order for a Rainbow reunion to happen, Ritchie Blackmore would have to play guitar in the band. Q:Rainbow has always had a changing line-up, why the new name now? JLT: Because Over The Rainbow is not Rainbow without Ritchie Blackmore on guitar. Q: Is it difficult to live up to the expectations the old fans may have? JLT: I think you have to ask the fans that question but so far the reception by the fans has been overwhelmingly positive. So, based on that, it seems like OTR is living up to the expectations. Q: Are you compared with the "old" Rainbow line-ups? JLT: We do not compare ourselves to old Rainbow lineups. Sometimes journalists and fans do this and we understand why they do it but we do not do it ourselves. Q: Do you care or do you want to do something new and different? JLT: We have been talking about doing a couple originals and have collaborated on tour. Q: Do you think that it's a good way that many new or young fans get to know the old Rainbow classics? JLT: ABSOLUTELY! In fact, the younger people (aged 16-36) seem to be our biggest growing audience, especially teenagers and those in their 20s. I think they appreciate the fact that musicians who made great classic rock in the 60s, 70s and 80s can really play, sing and write well. Q: Are you going to play mostly songs of the more "classic" Dio period or of the Joe Lynn Turner period? JLT: Our setlist covers all eras. There is a website called rainbowfanclan.com that posts some fan reports with setlists. We do change our set list in some cities depending on the types of fans in those cities. Q: Why did you start the tour in Eastern Europe? How were your experiences there? JLT: We started out touring Russia, the Ukraine and Belarus with OTR a few months after the band formed. We did some other "runs" in other countries (i.e. Japan), a few festivals and now are back here in Eastern and Western Europe with a major two month tour. Q: Is there any chance of your writing new songs? JLT: Yes, we are working on new songs. Q: Or even publishing a new album? JLT: We have talked about this and when we are ready to reveal details, we will send out the news to the media. Q: Is there going to be a live album or DVD? JLT: There are no definite plans right now but that's always a possibility for the future. Q: What are your impressions of Spain? JLT: I love Spain and have been there many times as a solo artist, with Big Noize, Hughes Turner Project, etc. JLT: Please tell the fans in Spain that we love them and thank them for their support! We look forward to seeing them soon! Peace, JLT.